Turn on the grill to a medium heat. In a bowl combine crabmeat, spring onion, dill, lemon juice and season with pepper. 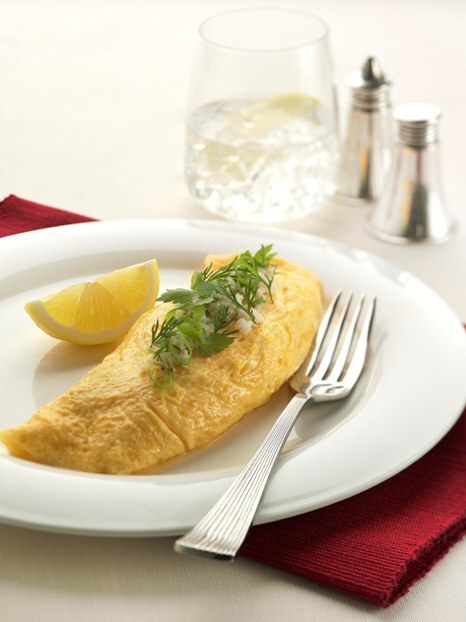 Crack the eggs into a bowl, add cheese and whisk, season with a pinch of pepper. Heat a non stick fry pan, add a 1/4 of the egg mixture and cook gently stirring occasionally until almost set. Spoon a 1/4 of the crab mixture onto the omelette, place under the grill to warm though. Remove from grill and fold in a rolling motion. Place onto a plate, garnish with sprigs of dill and sliced spring onions. Repeat the process to make the remaining omelettes. To serve: Serve with a side salad of rocket leaves, tomato, cucumber and grated carrot with a balsamic vinaigrette. Tip: Crab can be replaced with cooked, peeled and chopped prawns or smoked salmon.